Robinson, B.S., Bennie, J. Inger, R., Early, R. & Gaston, K.J. 2018. Sweet flowers are slow and weeds make haste: anthropogenic dispersal of plants via garden and construction soil. Journal of Urban Ecology, in press. Anthropogenic activities are increasingly responsible for the dispersal of plants. Of particular concern is anthropogenic dispersal of problematic invasive non-native plants. A common dispersal vector is the movement of soil containing seeds or rhizomes. Housing development and domestic gardening activities cause large quantities of soil to be moved, and understanding the role of these activities is critical for informing policy and management to reduce the spread of problematic plants. Here, by collecting soil samples being moved for housing development and domestic gardening, and observing the species that germinated from these samples, we determined the quantities and invasive status of plants moved. From our samples nearly 2000 individuals representing 90 species germinated. 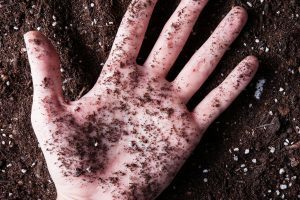 Our results suggest that given the quantity of topsoil needed to cover an average-sized UK garden (190m2), there could be 2.2 million and c.2 million viable seeds in soil sourced from housing developments and gardens, respectively. In both housing development and garden samples, native species were more abundant and species-rich than non-native naturalised and invasive species. Buddleia (an invasive) was the most common species overall and in garden samples; this is likely due to multiple traits that adapt it to dispersal, such as prolific seed production. The abundance of invasive and naturalised species was significantly higher in garden than in housing development samples, suggesting that informal movement of soil between gardens poses a greater risk of spreading invasive plants than commercial sources. Consequences for models predicting future distributions of plants, and strategies to mitigate anthropogenic dispersal of problematic plants are considered.